Thanks to Nikki Brown from the Ruby Team for sharing a story about the infamous Jack Ruby and how he became a Ruby, a path that many other immigrants followed in attempts to "fit in". As Nikki mentions, from the beginning of this project, the many Ruby origins were part of the fascination. When is a Ruby not a Ruby but still a Ruby? So far in our research we have found several different origins of the RUBY name. We have two large Swiss families (whose name originated in RUBIE and apparently before that with Rubin). We have a large family coming from Devon whose origins we are yet to trace. There is one group of Rubys in Wiltshire who seem to have originated from a long line of ROBYs. We have a researcher working some Danish Ruby families and are aware of a large population in France. It's already clear to us that the name has multiple origins in multiple countries. Interestingly, the most famous Ruby of all, was not a Ruby at birth but shortened his name to become one. 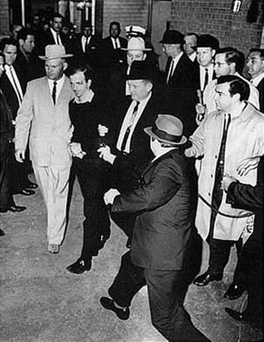 This of course was Jack Ruby, the man who shot Lee Harvey Oswald, the alleged assassin of president John F. Kennedy. However, it was not only Jack who legally changed his name but also his two younger brothers, who carried that name forward. There is a lot of information on the internet about this man, including videos of the shooting of Lee Harvey Oswald, which was seen on live TV. The most comprehensive account of Jack Ruby’s life is contained in The President's Commission on the Assassination of President Kennedy, known unofficially as the Warren Commission, which was established in 1963 to investigate the assassination of President John F. Kennedy. The family’s name was originally Rubenstein or Rubinstein. Joseph Rubenstein married Fannie Turek Rutkowski in Poland which was their birthplace. Four years later, he left behind his wife, son Hyman, and daughter Anna, to travel to England and then Canada before entering the United States in 1903. A year or two later, Fannie and the two children followed Joseph to the United States. The family settled in the Jewish neighbourhood in Chicago, Cook County. They had 2 more daughters, Mary (later known as Marion), and Eva. The 1910 records show that Joseph and Fannie had had another child that died, and it is thought that they may have lost another child later. Jacob Rubenstein was born in 1911. The exact date is not clear but the date he used most often was the 25th March 1911 . Jacob had 3 younger siblings. The first two were Samuel and Earl. The youngest Rubinstein child, Eileen was born in 1917. Family life was dysfunctional. Joseph and Fannie fought, apparently fuelled by Joseph’s drinking and Fannie’s quick temper. Fannie suffered from mental illness and the children were placed in foster care for some time. Their parents separated in 1921 but were later reconciled. All the children had multiple occupations and Jack did various jobs before becoming involved in horse racing and moving briefly to California before being drafted into the US Air Force. After the army, he moved to Dallas. The girls married and so obviously took on their husband’s names. Both Jacob and Samuel started using shortened versions of their forenames, that is, Jack and Sam. Before changing his surname, Jack made an addition to his birth name. A friend of his friend, Leon Cooke, was shot in the 1939 and died a few weeks later. Jack adopted the middle name Leon in memory of this friend, although he only used it infrequently. 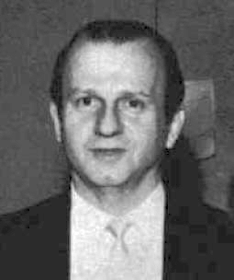 Jack Ruby had multiple business ventures, but his main source of income was from running dance halls, night clubs and strip joints. He was arrested for minor offences, but never convicted, with suggestions that he gained favours from Dallas police who frequented his clubs. It was in 1947 that Jack, Earl and Sam legally changed their surname from Rubenstein to Ruby. Earl said this was because everyone called him Ruby anyway and, also that a former employer advised that it was better to have a non-Jewish name on mail orders for his company Earl Products. On the 24th November 1963, millions of Americans watching live TV witnessed Jack Ruby fatally shoot Lee Harvey Oswald, the accused assassin of President John F. Kennedy, in the Dallas Police Headquarters, while he was being transferred from the city to the county jail. Jack’s trial began on the 4th of March 1964 and ten days later, he was convicted of murder with malice and sentenced to death. He sought an appeal and on the 5th October 1966 the court ruled that his earlier motion for a change of venue should have been granted. However, 4 days later Jack was admitted with pneumonia to Parkland Hospital, Dallas, Texas. It was discovered he had lung cancer and died from a complication of this on the 3rd January 1967. Jack was buried at Westlawn Cemetery, Chicago, Norridge, Cooke County, Illinois, USA, next to his mother. On Earl’s death in 2006, an announcement in the Chicago Tribune gave details of his family and therefore the continuance of the Ruby name. The other brother who carried forward the surname Ruby was Sam as The Warren Commission Report states that one of the reasons for Sam’s move to Dallas was because of his son’s asthma. Therefore, we can see the “birth” of these Rubys in 1947. Two of the three men who changed their name had a son and both of them had at least one son too, so this Ruby branch continued.